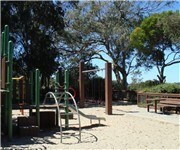 This is an older playground tucked away in this hilltop park. A great choice for kids who like to wander along paths, and can handle stairs. How Would You Rate Buena Vista Park?